Melva Robb told us all about how the history of Fivebough, including traditional owners, the Wiradjuri people used Fivebough Wetlands as a stop-over between the Murrumbidgee River and the adjacent hills. From the mid 1940’s to 1960’s approximately 20 ha of the western edge of Fivebough was leased to the Leeton Cannery. Waste from the cannery was consumed by grazing of pigs. In August 2001, the Fivebough and Tuckerbil Wetlands Trust commenced the nomination for listing Wetlands as being of International Importance under the Ramsar Convention on Wetlands. Fivebough and Tuckerbil Wetlands become a Ramsar site under the Convention on 21 October 2002. Bec Byrne talked about the management of the wetlands. It is a complex job to ensure weeds/pests are under control, Cumbungi controlled, walking track upgraded, new bird viewing shelters put in place, plus keeping up with environmental water releases to name a few. There has been $647,000 used to upgrade Fivebough since 2015 which is a huge undertaking. There are still many more upgrades in the pipeline. The earlier we can prepare for future climate impacts the better we can plan and adapt. Max O’Sullivan talked about the birds of Fivebough and Tuckerbil giving us insight into the types of birds that are local, those that are migratory and waders. How some birds like to feed in the mud while others like the water a bit deeper. Fivebough and Tuckerbil are managed to try and cater for the varying needs of these birds. Some of the birds come and go at different times of the year like the Brolgas who come in the winter and often remain locally until late spring. Some others come from Siberia all the way to Fivebough. Carmen Amos provided us with stories about student reactions to frog calls and allowed us to listen to the FrogID app found at www.frogid.net.au/. Some of the frogs we heard on the app were the Peron’s tree frog, the Giant Banjo Frog and the Sudell’s Frog which are burrowing species. These frogs are all found in the Murrumbidgee Catchment. Dr Keith Hutton pointed out that all the migratory birds are subject to international agreements with China, Japan, Republic of Korea and others to protect migratory birds that come to Australia from their territories. Fivebough Wetlands is not only significant in the Riverina and Murray Darling, but also throughout Australia, as far north as Siberia and Japan and beyond the Arctic Circle. And we have it in our own backyard…amazing! 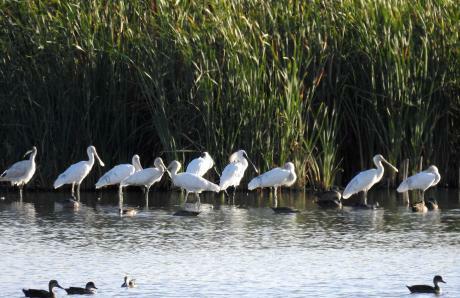 We need to look after all of our wetlands. Many people contributed to the success of the evening and I would like to thank all the speakers, helpers and attendees along with the NSW Department of Industry - Land and water for funding the catering from The Hungry Fox for their wonderful support. 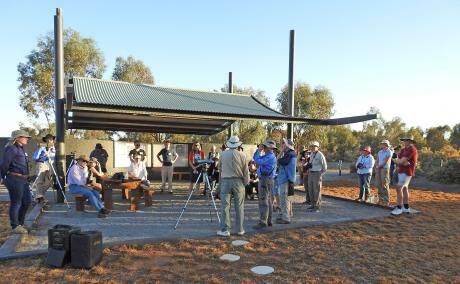 After the initial meeting in the Presbyterian Church Hall followed by the group meeting at the picnic shelter at Fivebough, the group moved down to the first viewing platform in the wetlands to see what birds were about at that time of the evening. On the way several groups of both Australian White and Straw-necked Ibises flew over on their way to their night roost away from the wetlands, unlike their cousins the Glossy Ibis that fly into wetlands to roost for the night. At the viewing platform looking over the remaining body of water in the southern pond, we were able to view a goodly array of water birds including Pelican, Black Swan, Australian Shelduck, Grey Teal, Black Duck, Pink-eared Duck, Hardhead and a preening Freckled Duck close for all to see. As well, there were Black-winged Stilts, both Yellow-billed and Royal Spoonbills – the latter in breeding plumage with their wild head feathers showing, Great Egret, Cattle Egret, Purple Swamphen, Coot, Red-kneed Dotterel and a small group of Sharp-tailed Sandpipers also flew in. The only raptor seen was a lone Swamp Harrier along with a few Galahs flying through and hundreds of Common Starlings flying in to roost in the reeds for the night. Other birds possibly seen by some of the other observers would have been Australasian Shoveller, Chestnut Teal and Masked Lapwing and possibly Little Black and Little Pied Cormorants. The fading light got the better of us and we made a hasty exit in the evening light to get back to the cars. It was from all accounts a very successful afternoon and thanks to Kathy Tenison for doing all the organising beforehand and on the day.